skipped 08 completely, studied a full 8 days in 09. result: a bit too close for comfort, but still over the hurdle. Looking back, to be safe one needs 2 full weeks. A few more thoughts: the exam itself was difficult for me in the sense that on the luck scale i was low as many topics i knew well didnt show up, others did. I found ethics very perplexing but somehow got 70+, would have never guessed. congrats bud. You are very famous person on AF. congrats bleron - - you going to try for Level 3 next year? note: just because it doesn't make sense doesn't mean that it's not merry. i will probably register for l3 and then who knows the schedule how it will change, but i would like to sit for it if possible yes. Given its the last part, I will probably dedicate 2 full weeks so that i complete the program safely and not borderline like this time. i will show up in forum about 3 weeks from exam date though. this time i was traveling two weeks before exam date and didnt have the oppty to enjoy the benefits of exam discussion in forum, i think in l1 it helped me quite a bit with things that seemed confusing from time to time. manure, how come is such a bad word and you’re full of it? I mean, it’s ‘newer’, which is good, and a ‘ma’ in front of it, which is also good. Ma-newer, right? How do you even come close to going over the material in that time? Do you just do practice questions? I just passed L1 in June and I’ve already started for L2 next June because I feel like I’m going to need all the time I can get (although I’m working F/T and have a baby on the way, so I want to get time in while I can). I just can’t even imagine being anywhere near prepared after a week! I’m assuming you’ve been exposed to the material in school prior to starting your studying? Your a legend in these parts Bleron. Congrats on the pass and see ya in L3. I need to learn some of your tricks. 3. You must do this on a computer screen, i.e. purchase scan notes or scan them, not on paper. You will go faster and be more disciplined. 4. Reading notes and practice questions took me 5 days. The next day I did 2 full length exam, did some qbank questions (total time on qbank 8 hours, I would have needed 36 hours of qbank to nail the exam. 1. Studying intensely as opposed to over many months increases your efficiency dramatically because of the tricky nature of the exam. Often in exam I would know the topic but answering the question required more, and having fresh questions reviewed on mind I would know the trick. 2. I did it with 8 days, 2 weeks I think I would have gotten 70+ in everything or close to it in my mind, but let’s say you want to be safe, then give yourself 25 full days of doing nothing but CFA in the methods described, adding time for qbank, taking more practice exams, and reading notes slighlty more slowly, and I will be damned if your result will not be better than studying for 8 months. With regard to ma-newr dude above, you can always only chose what you like to believe. And do not take my post as a hit on your low self esteem and insecurity. I assure you, try my method and you will be surprised how much more efficient even your brain can become when you add so much pressure that it doesnt have time to worry about the pressure but only struggle to “survive”, in the sense of the task it faces. I have no doubt in my mind that you passed L2 by studying in the manner that you suggested. So I am not calling bull. There have been a couple of other people that have posted this as well. I get it. You are very smart. But being that you are a smart individual, don’t you realize that most people can not pass this test in 8 days? Did you really sign onto an online forum to brag to a bunch of people you do not know, to tell them how smart you are? Or is this your recommended course of study for the average individual, study for 2 weeks and you are good to go? Before starting the CFA I had a chance to speak w/ people that I consider to have an above average level of intelligence (directors of research, mutual fund/hedge managers…all at fairly well known institutions) most said they studied a minimum 4 months for each level (one of my friends did it w/ 2 months…but he did not jump on analystforum to brag about this). I would say that is good advice, telling people all they need is a solid 2 weeks does not seem like smart advice. ^ that is why Bleron is different from most of us. Go and search this forum to know how famous he is on AF. Being brilliant as he is, does anybody really need a CFA Charter to prove his knowledge/abilities/commitment in securing a profession in Finance? And. being so smart, why do you even waste 8 days to get a CFA charter? Bleron, what’s your IQ? It’s gotta be above 140. What types of techniques do you use to absorb and retain the material? Do you have near photographic memory? its not a waste. I learn a lot and refresh a lot more in the course of preparing for the exam. But the answer is exactly in why you need the charter to decide how long you study. Of course if CFA is decisive in your career, then you dedicate 8 months or however many the people do. But if it is to better yourself and learn, to get the charter because it may help ever so slightly or in the future, then for some 8 months is too long a sacrifice. Now for al that think cfa passing is a brag, give me a break. The method I suggest is not for the average person, but it is for the average person that deserves the CFA. Those that dont, 8 months or 18 would not matter, thats why 60% fail each time no? I spent 8 days, I dont recommend it, simply say in my opinion most can do it, but lets say 8 days is a bit tight, everyone that will eventually pass the CFA (except for 3+ time takers), would most likely pass the exam, or at least increase chances dramatically with 25 days of focus studying, rather than spend an entire year or many months. I can remember numbers, really remember them, not so much with names. My technique is simple, corner your brain into overdrive, maximum focus with no distractions so that you even dream CFA for a few days. Also, sleep little, as you want to really keep alive those corners of the brain that you often dont use, and someone once said that that is over 90%. I am not sure its 90%, but I know its a lot, because otherwise we would have a more humane society, wouldnt we? go to aquasana.com to learn why you should only drink filtered water, and its cheap! > Bleron, what’s your IQ? It’s gotta be above 140. What you are suggesting is not going to be feasible for the average CFA exam taker. Especially so during periods of high cortisol levels, which will decrease the ability to assimilate and retain information. You must have an exceptional ability to assimilate and retain information as you have admitted in your ability with numbers. I see what you are getting at with the overdriving of the brain strategy, but for 90%+ of people, that is not likely to produce a favorable result. Have you seen the videos of the guy that has an exceptional ability to learn languages? He learned Icelandic to a basic conversational level in about a week. 99.9% of the population does not have that capacity; much like your ability in taking and passing the CFA exams. If there is 0 correlation between IQ and passing the CFA exams, then mentally retarded individuals should have a fair shot at passing. I would say that having a relatively high IQ is a necessary but not sufficient condition for obtaining the charter. 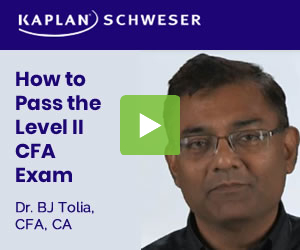 Saying you passed the cfa is not bragging. But it seems you just signed up on this website to tell people it only took you 2 weeks to study for the exam. Just seems pointless in my opinion. While, I am jealous of your ability to pass L2 w/ 8 days of studying, most people need to put in a little more work. In my opinion, hard work and perseverance is not a waste of time. i signed up back in dec 06 because i needed help to pass with just 7 days of study. it helped me a lot, especially in areas brand new to me, i.e. fsa. it also helped me learn terms like schwesser, notes, mock exams etc. Back in the day i used something called prosomething, that was cheap and effective, but i dedicate 30% of my result to cfa forum, in l1. in l2 that went down to zero, mainly because i didnt want to waste the posting time and didnt feel like entertaining when market was taking an ecstasy pill. to answer the question how: 1. I am probably more exposed to the material than the average person, but say you add 1 week of study to catch up with me, for the least exposed person (provided you know enough algebra required which i assume everyone does who registered, otherwise why bother.) 2. I read the entire schwesser notes, every single page, but very fast. at the end i took the practice questions, when i didnt know an answer I would go back to the material before answering it, so my practice answers were about 65% + add 25% after “cheating” 3. You must do this on a computer screen, i.e. purchase scan notes or scan them, not on paper. You will go faster and be more disciplined. 4. Reading notes and practice questions took me 5 days. The next day I did 2 full length exam, did some qbank questions (total time on qbank 8 hours, I would have needed 36 hours of qbank to nail the exam. 5. The 8th day, friday, I did 2 more exams, I reviewed my answers, right and wrong ones (this I would do on paper not on screen btw.) At around 7pm I started taking the online sample paid exams. Those are an absolute must. I took the exams and reviewed the answers quite carefully. My scores were 83, 70 and 65ish if I remember correctly. I went to sleep at 330AM (would not advise it, but I fell behind the schedule a bit so had to push it.) Here are two more things i want to add: 1. Studying intensely as opposed to over many months increases your efficiency dramatically because of the tricky nature of the exam. Often in exam I would know the topic but answering the question required more, and having fresh questions reviewed on mind I would know the trick. 2. I did it with 8 days, 2 weeks I think I would have gotten 70+ in everything or close to it in my mind, but let’s say you want to be safe, then give yourself 25 full days of doing nothing but CFA in the methods described, adding time for qbank, taking more practice exams, and reading notes slighlty more slowly, and I will be damned if your result will not be better than studying for 8 months. With regard to ma-newr dude above, you can always only chose what you like to believe. And do not take my post as a hit on your low self esteem and insecurity. I assure you, try my method and you will be surprised how much more efficient even your brain can become when you add so much pressure that it doesnt have time to worry about the pressure but only struggle to “survive”, in the sense of the task it faces. That is real efficiency. But still people wouldn’t take that risk, and most importantly they don’t have to! Time will testify that ten years is but several inches longer of your hair. Who knows what one “needs” to pass? The reason most people spend so much time on it is because they don’t want to risk failure. I don’t know a single person in real life who went into the test with the objective of studying the fewest number of hours necessary to pass. You only find these people online. Most people care about the embarassment they will face at their workplace after failing, being forced to spend even more time studying instead of living life, and having to repay the fees. The other reason people don’t spend 1 or 2 weeks studying is because they have lives that get in the way. I have a job, a supportive girlfriend, and no kids. I was pissed that I had to travel the weekend before the exam instead of study, but I know people who have been in a much worse situation thanwhat I faced while studying. If you really have nothing stopping you from studying all day and every day, then good for you. But 100 hours spent over 8 days or 8 months is still 100 hours. Well……did you pass L 3? Details please. Bleron, maybe you are that damn efficient. But I must say, your strategy is not effective. Your photographic memeory is an asset for you in that you can MEMORIZE, not understand things; I must say. Can you remember a single thing that you had read before the exams? If you think of only PASSING, I have nothing to say, but if you really want to be a professional, i guess, you will see your anaytical skill to be much lower. No offence meant. Black Swan passed Level III with 1 week of studying. It was not by choice and I don’t think he would recommend slacking off. I can’t see how anyone could pass level 3 with one week of studying. It’s really not even possible with the morning section being essay/short answer format. CFAI recommends spending what 250-350 hours? I can’t see how you could spend 7 days on studying and pass. Sounds like a lot of BS to me. Anyway, even if it is true, don’t come on here and brag about it. It’s disrepectful and no one cares. People on this forum are serious about the Charter and about learning and understanding the material. Everyone wants to pass, that’s a given, but unless you can actually somewhat remember and use the material you’ve learned, what have you gained? It is possible to pass in 1 week if one has a previous strong background. I don’t see why a professor from a reputed business school such as wharton would spare more than 1 week preparing for each level of CFA program.